Wow, we’re getting ready to start the month of May—my favorite month of the year! It’s my birthday month, and my anniversary month, but even more, May is usually a great month to spend some time outside. What’s on your to-do list this May? Here’s this month’s Get Organized Checklist. Set your goals for the month. Create some just-for-fun goals for the summer. That’s right—goals don’t have to be just about serious stuff. 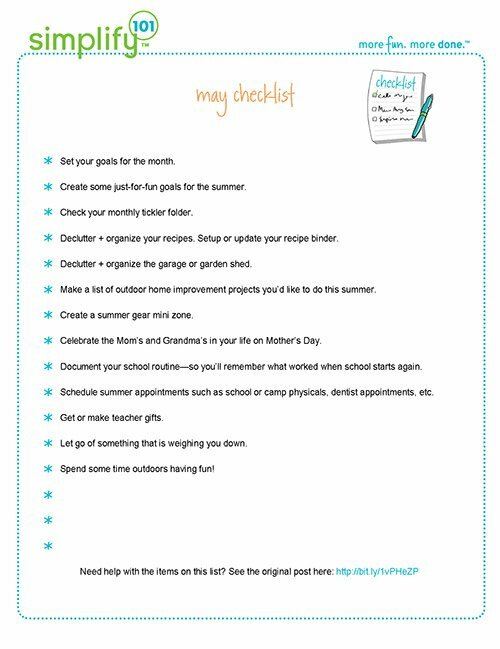 With summer just around the corner, why not set some just-for-fun goals that you can work on over the next few months? Check your monthly tickler folder. Distribute papers to the appropriate daily folder. Check out this post on tickler files. 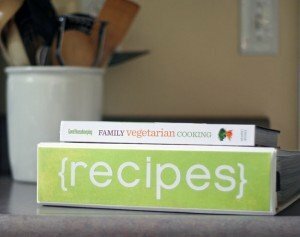 Declutter + organize the garage or garden shed. Around here, May is a great time to tackle outdoor projects like organizing the garage or garden shed. Make a list of outdoor home improvement projects you’d like to do this summer. Take a tour outside your home and make a to-do list. My list includes painting our shutters and possibly the front door. But first…I have to decide on a color! Create a summer gear mini zone. 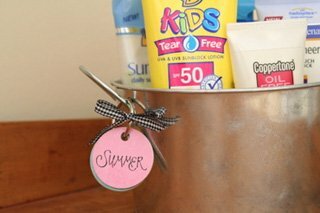 Establish a spot in your home for summer essentials like sunglasses, sunscreen, bug repellants, lip balm, and other items your family needs for summer outings. Check out this post for some other summer mini zone ideas. Celebrate the Mom’s and Grandma’s in your life on Mother’s Day. Document your school routine…so you’ll remember what worked when school starts again. The first couple of weeks back to school are always a bit clunky around here as I try to tweak the morning routine. But this late in the school year, it’s smooth sailing. Now is a great time to document your morning routine…so you don’t have to reinvent the wheel when the kids return to school next year. Schedule summer appointments such as school or camp physicals, dentist appointments, etc. Let go of something that is weighing you down. This could be a physical item in your home—something that you’re holding onto out of guilt or a sense of obligation. Or, this could be an ongoing time commitment. Just pick one boat anchor in your life this month…and let it go! Spend some time outdoors having fun! That’s right, make sure to take time to enjoy May and all it has to offer!